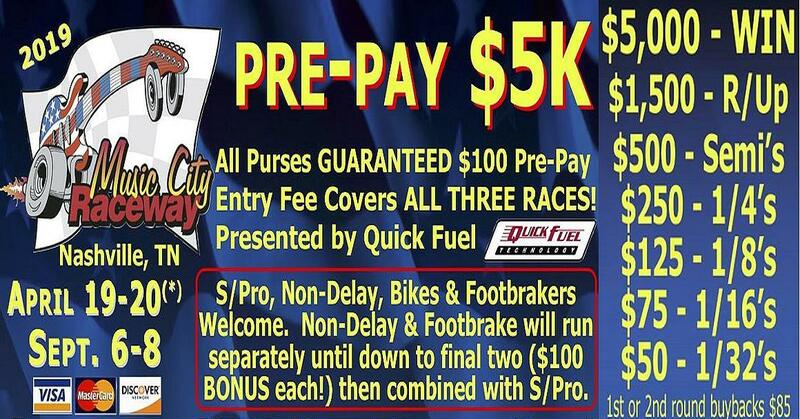 Three $5,000 to Win GUARANTEED Races for Just $100 covers all three racing event entries. Super Pro, Non-Delay, Bikes & Footbrake welcome. Non-Delay & Footbrake will run separately until down to final two ($100 BONUS each) and then combine with Super Pro. $5,000 to Win, $1,500 Runner Up, $500 Semi's, $250 1/4's, $125 1/8's, $75 1/16's and $50 1/32's. $85 buyback. SAVE $200 per weekend entry if purchased two days prior to event (SAVE $400 with two entries bought in advance for six $5K races!). Gate price per weekend entry $200 or $100 per $5,000 race if not bought in advance. Multiple entries allowed. Entries one-time transferable. No gold cards. 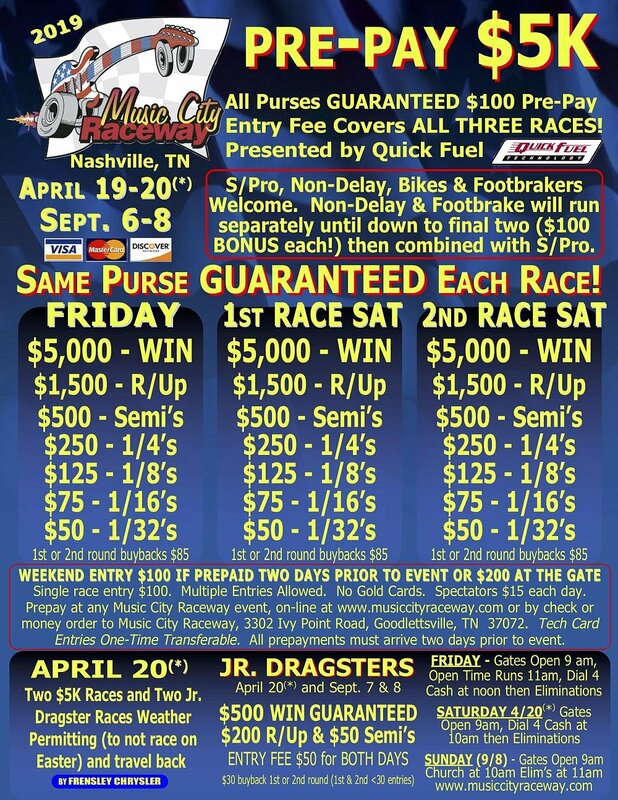 Also running two Jr. Dragster Races $500 to Win GUARANTEED with $50 Entry Fee covering BOTH races for the April race. SPECIAL NOTE due to Easter Sunday: The three (3) race events are scheduled to run with one (1) on Friday and two (2) on Saturday. Sunday is an alternate or travel day. That means Jr's will two (2) races on Saturday. All weather permitting.